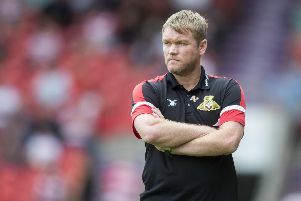 Doncaster Rovers boss Grant McCann took extra satisfaction from seeing his side return to winning ways against an impressive Luton Town outfit. Goals from midfield duo Matty Blair and Ben Whiteman helped Rovers secure their first win in seven attempts in all competitions. Rovers were made to work for victory by a Hatters side that McCann expects to figure in the League One promotion shake-up. “It was important to get back to winning ways,” said McCann. “I think we’ve shown that our performances have been really good in the league. “To play the top two and get two points and then to play a very good Luton team and beat them is very pleasing. “I said it on Thursday you can see the work that goes in on the training ground when you watch a team like Luton. “I’ve got a lot more respect for that than a team that just wants to pump the ball up the pitch all day. He added: “I think we definitely showed another side to us. We dug in when we had to. “We conceded a sloppy goal which the players will see and learn from. “But when we needed to roll our sleeves up and see the game out we did. “We’re showing our steel at the minute. “We’re showing both sides of our game. “I think we showed our quality in the Peterborough and Portsmouth games. Meanwhile, captain Tommy Rowe will be sidelined for around ten weeks with a hamstring injury sustained during last week’s Checkatrade Trophy defeat to Newcastle United Under-21s. Rowe underwent hamstring surgery over the summer but McCann insists his latest setback is a new injury. “It’s a big blow, a massive blow for us to be without our skipper for that length of time,” said Rovers’ boss.